Finish Line / Starting Line Kit: FL-10 race starting line. Aluminum triangle truss can nest together when packing, making it a cost effective choice for transport to race event sites. The FL-10 is one of our larger race starting lines. The horizontal lengths of triangle and ladder truss attach with extender hook clamps, allowing for adjustable heights to accommodate any size banner or signage. These extra support trusses also provide a space to hang timing clocks, extra signage, lighting, and other truss products. The FL-10 kit has a large gantry-style footprint, which provides extra stability and extra banner support. 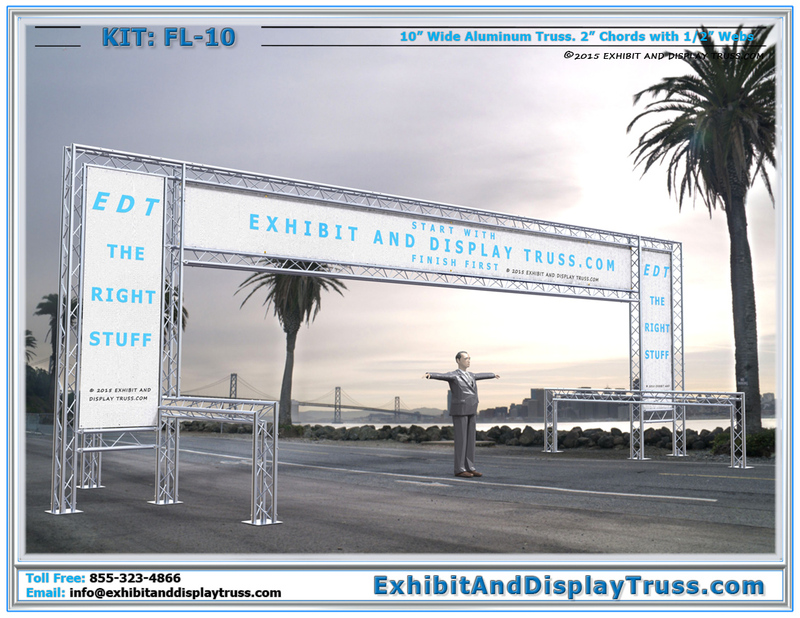 Whether its 5k or 10k races, marathons, triathlons, bike racing, or trade show archways, Exhibit and Display Truss will work hard to suit your needs. Finish/Start line kit FL-10 race starting line. 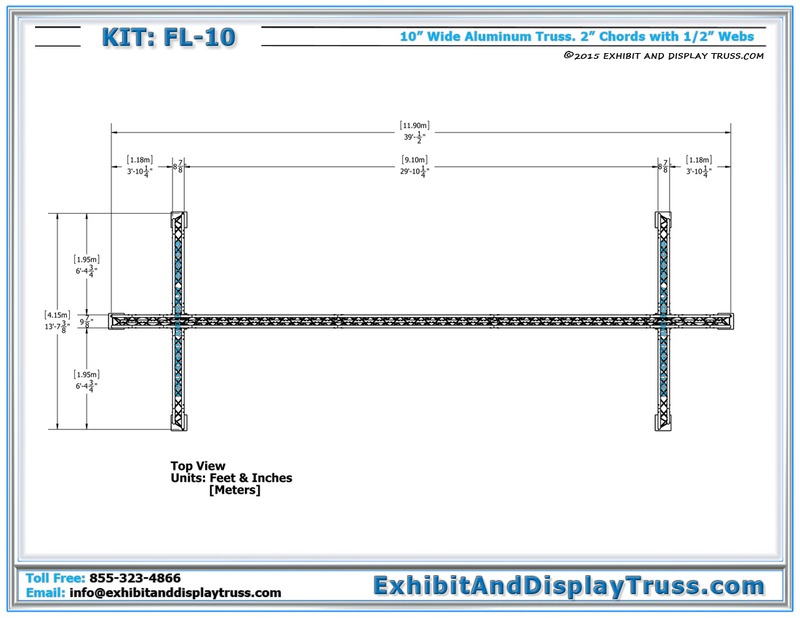 Exhibit and Display Truss offers a wide variety of truss parts and finish line accessories. 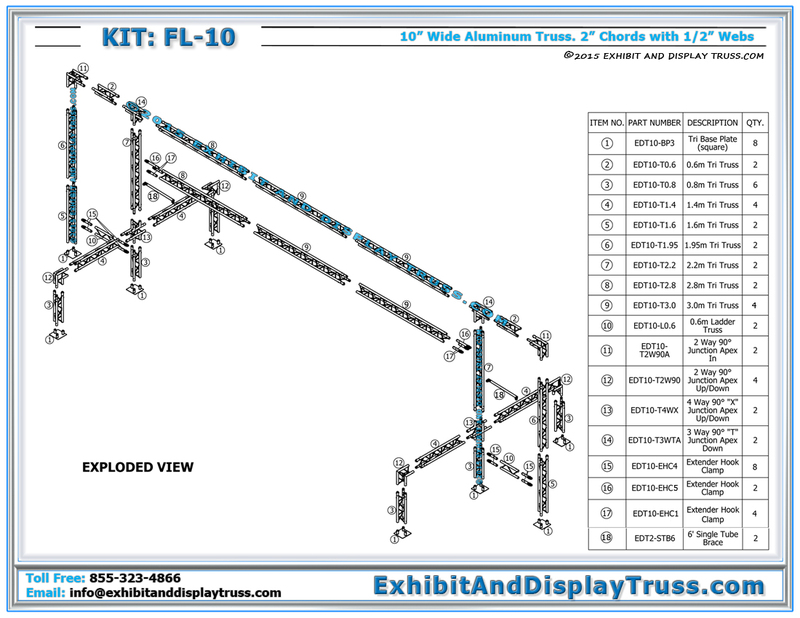 Exhibit and Display Truss stocks standard parts and race events kits and also has the ability to build custom parts and booths if your project requires unique configurations. If you cant find what you are looking for out of our standard systems or parts, do not hesitate to ask for a custom length or size. Connection inserts (and hardware) come standard with each truss part, allowing for a quick and easy assembly of your start finish line kits. Choose from our wide variety of start finish line ideas! 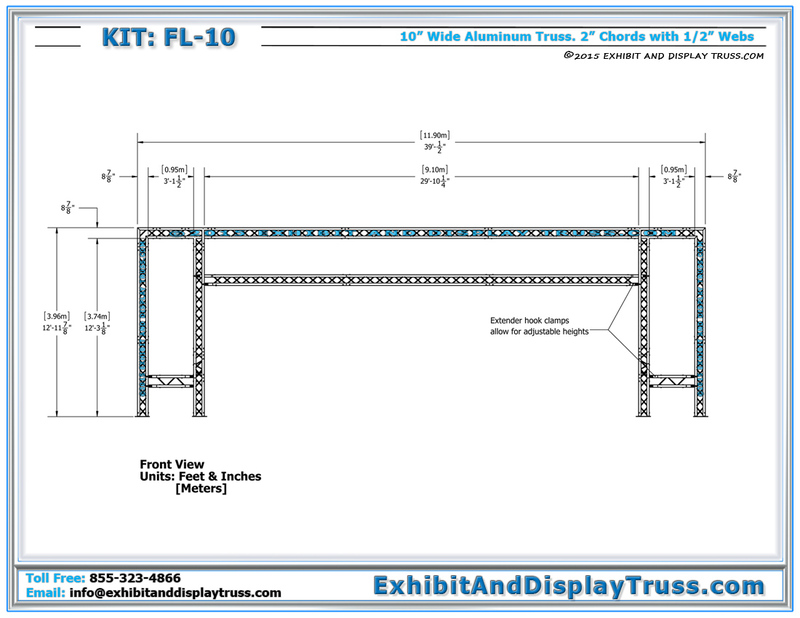 Truss components are constructed of square, triangular or flat pieces. All of our truss structures are designed for ease of assembly and available in a number of truss designs and sizes. Our truss systems and finish line kits are constructed of durable, high-strength aluminum and steel for supporting LCD or plasma screen mounts, banner frames and sign frames, lighting truss and other finish line accessories. All of our finish lines and truss archways are designed for ease of assembly. All 10″ Wide Aluminum Truss parts (2″ Chord/Tube Diameter) use a 2″ tube connection insert system. The 2″ Tube Connection System fits all 10″, 12″, 18″ and 24″ Inch Wide Truss Parts. All insert spigots are made with 6061-T6 (SS) Aluminum. The 2″ chord truss connecting system is a simple insert secured with a M10 Nylock nut and bolt with 17mm wrenches. It is a strong, reliable, and easy to use method of assembly. For a very fast set up without any tools, quick clips can be used instead of the standard nuts and bolts.